NEWARK, NJ (October 8, 2013) – Panasonic has announced delivery and pricing for the AG-AC8PJ, an AVCCAM shoulder-mount with exceptional ergonomics and functionality. The AG-AC8PJ, with 1080p recording capabilities, is ideal for shooting weddings, business conferences, documentaries, sporting events (including 720p at 8Mbs, optimal for use with leading coaching analysis systems), exhibits and government activities. The AC8PJ will ship in October with a suggested list price of $1450.00. 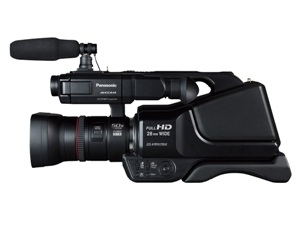 The AC8PJ offers a wide range of recording models including:1080/60p [Max. 28Mbps/VBR], (1920x1080/60p); PH [Max. 24Mbps/VBR], (1920x1080/60i); HA [Ave. 17Mbps/VBR], (1920x1080/60i); HG [Ave. 13Mbps/VBR], (1920x1080/60i); HE [Ave. 5Mbps/VBR], (1440x1080/60i); PM [Ave. 8Mbps/VBR], (1280x720/60p); and SA [Ave. 9Mbps/VBR], (720x480/60i). government and commercial enterprises of all sizes addresses unified business communications, mobile computing, security and surveillance, retail point-of-sale, office productivity, visual communications (projectors, displays, digital signage) and HD video production. Panasonic solutions for business are delivered by Panasonic System Communications Company of North America, a division of Panasonic Corporation of North America, the principal North American subsidiary of Panasonic Corporation. All brand and company/product names are trademarks or registered trademarks of the respective companies. All specifications are subject to change without notice. Information on Panasonic solutions for business can be obtained by calling 877-803-8492 or atus.panasonic.com/business-solutions/. Panasonic Corporation of North America provides a broad line of digital and other electronics products and services for consumer, business and industrial use. The company is the principal North American subsidiary of Osaka, Japan-based Panasonic Corporation, and the hub of Panasonic’s U.S. branding, marketing, sales, service and R&D operations. In Interbrand’s 2013 Annual “Best Global Green Brands” report, the Panasonic brand ranked number four, the highest ranked electronics brand in the report. (http://www.interbrand.com/en/best-global-brands/Best-Global-Green-Brands/2013/Best-Global-Green-Brands-2013.aspx) As part of continuing sustainability efforts, Panasonic Corporation of North America last month relocated its headquarters to a new facility built to meet LEED certification standards, adjacent to Newark Penn Station in Newark, NJ. Learn more about Panasonic at www.panasonic.com.